No composer exerted a greater influence on the music that came after him than Johann Sebastian Bach, who was born on this date in 1685. As we celebrate his birthday, let us consider one distinctive way in which composers have paid homage to the master: by using Bach’s name itself as a musical motif. In German nomenclature, the note (and key of) B flat is represented by the letter B; B natural is represented by the letter H. A and C are just as they are, so to spell out Bach’s surname in musical form yields a four-note motif consisting of B flat, A, C, and B. Bach himself used the motif (a kind of autograph stamp, sometimes surreptitious, sometimes not), and many others followed his lead: Robert Schumann, Franz Liszt, Max Reger, Arnold Schoenberg, Francis Poulenc, Anton Webern, Arvo Pärt, Krzysztof Penderecki, and Alfred Schnittke among them. One of the most imaginative uses of the motif came from a composer who is too often overlooked by music critics but who happened to be one of the most innovative and arresting voices in 20th-century music, Bruno Maderna. Born in Venice in 1920, Maderna was a dazzling child prodigy, even by child prodigy standards, playing several instruments including the violin, conducting the orchestra at La Scala at seven, and performing the Bruch G minor Violin Concerto at the same age. He began devoting himself to composition in 1941, but not until after the Second World War (during which he had served in the Italian resistance) did he began to develop an individual style. In 1947, Maderna sent one movement of a concerto he’d been working on to the composer Luigi Dallapiccola, who was 16 years his senior. Dallapiccola, a lyrical modernist, was generally positive, but he also urged Maderna to be more precise, more rigorous in his musical thought, and to dispense with a few derivative devices. Above all, Dallapiccolla advised, the young man should look to the example of Bach and master the age-old techniques of counterpoint. Dallapiccola proved to be immensely influential, as did another proponent of 12-tone modernism who came into Maderna’s world, the conductor Hermann Scherchen. In September 1948, Scherchen was asked to lead a workshop on conducting and musical analysis at the International Festival of Contemporary Music in Venice. Scherchen had famously conducted the premiere of Schoenberg’s Pierrot Lunaire in 1912, and his credentials as a new-music advocate were unimpeachable. Scherchen quickly recognized the two brightest talents in his workshop—Maderna and Luigi Nono—and he helped get the two enrolled in the Darmstadt International Summer Courses for New Music in Germany, a breeding ground for a whole school of postwar serialists. It was there that Maderna met Pierre Boulez, Olivier Messiaen, John Cage, Karlheinz Stockhausen, and many other prominent composers both old and young. No piece is more emblematic of this early period of Maderna’s than his Fantasia e Fuga for two pianos, which received its premiere at Darmstadt in 1949. Not only is it constructed around three 12-tone rows, in such a way that the B-A-C-H motif is prominent throughout, but it also makes full use of the contrapuntal devices and polyphonic textures that were hallmarks of Bach’s output. The piece begins quietly and simply with a wisp of a melodic idea, a fragment that is probing and uncertain. A thunderous chord announces a change in temperament, and soon, a propulsive energy takes over. I sense the influence of Prokofiev here, in particular, certain moments in the late piano sonatas, with the music machine-like in its relentless drive, its motion without pause. This portion of the work is episodic, almost jazz-inflected in certain of its wilder passages; if Ravel’s Piano Concerto were amped up and reimagined for a post-tonal age, it might sound something like this. The piece is called Fantasia e fuga, and a third of the way into it, we come to the fugue. And what a fugue it is, beginning, as it does, with a variation of the B-A-C-H motif: not B flat, A, C, B, but rather A, B flat, C, B—Maderna paying homage but also asserting his own presence. By turns brooding, powerful, and mysterious, this fugue is as rigorous, as tightly organized, as Dallapiccola might have hoped for, building slowly, inexorably, to a grand passage that culminates in a restatement of the B-A-C-H motif, followed by a sequence of descending, organ-like chords. A third section returns us to the world of fantasy, with some tumultuous passagework leading to a section that quotes Bach’s Vor deinen Thron tret ich hiermit. This chorale was the last piece that Bach worked on, as he lay in bed dying (so the story goes), revising a melody he had written long before by removing its florid elements and providing instead an exquisite and sophisticated contrapuntal depth. It’s a stately piece, full of resignation, reminiscent of the fugue from Bach’s C major Violin Sonata for unaccompanied violin. That Maderna chose to quote it here is all the more poignant given the passage’s funereal quality, the ending quiet and pensive, serene yet not quite becalming, with the final chords sounding like the tolling of distant bells. 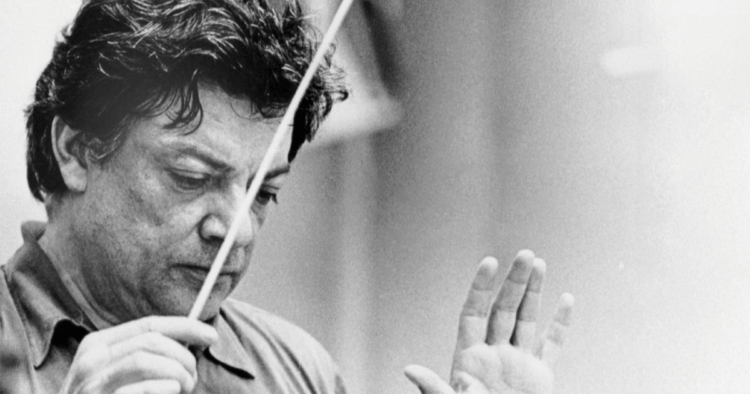 Maderna would go on to compose many pieces in many genres: instrumental and chamber works; concertos (the three for oboe are particularly compelling); orchestral masterpieces such as Aura, Biogramma, and Quadrivium; electronic scores; work for radio, films, and the theater. (He was also sought after as a conductor, capable of interpreting a symphony by Mahler with the same visionary insight that he brought to the thorniest contemporary score.) But though he was a staunch and daring modernist, Maderna learned early on that a composer must reckon with the past before looking to the future—and that it serves one especially well to pay close attention to Bach.